Rev Dr Noble McNeely, Moderator of the Presbyterian Church in Ireland visited 4th Newtownabbey, Carnmoney Presbyterian to present them with the Charity Shield for raising the most money (£1751) for the Junior Section Presbyterian Appeal. 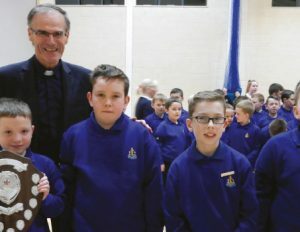 Each year the Junior Section Boys in Presbyterian Churches throughout Ireland are challenged to work together to help the world-wide extension of The Boys’ Brigade and support a project that benefits young people overseas. During the 2016/17 BB session the Junior Section Boys raised funds to support an education project in Kenya, ‘Crossing the Line’. The total raised was £9547; £8309 was given to the Crossing the Line Project and £1000 donated to the Global Fellowship. Since it was set up in 1966 the Mission Committee has raised over £900,000, including just under a quarter of a million pounds for the Global Fellowship. The project for 2017/8 is to fund the refurbishment of a Youth Camp for the young people of the Church in Romania. Fund raising packs were sent out to all Junior Section Leaders in Charge in Presbyterian Boys’ Brigade Companies in Northern Ireland during September 2017.